In a few Short hours I will be making my way to Long Beach California, for Apocacon, where I will be meeting a many authors, one of which will be S. W Tanpepper the author of this book. Which is next on my list to be reviewed. I will say this for Game Land, I picked this book up and COULD NOT put it down, I was sucked in from page one and I wanted to know what was going to happen to lead up to how this book started. This book is amazingly well written, it makes you care about the characters almost immediately. With each page more and more was revealed but not enough to give the whole story away not at all. This book is written in a way that’s got you on the edge of your seat, chewing your nails and yelping at the things that go bump in the night. S.W Tanpepper does an amazing job in setting up the world in which our characters live in, explaining some things while leaving other’s to be revealed in the far off future. 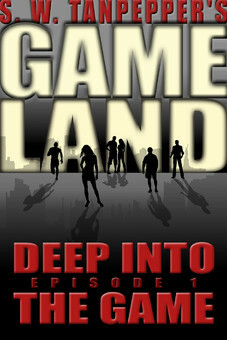 Of which there is of that, Game Land, Deep into the Game is the First Episode in Season 1 of S.W Tanpeppers world. He spins his tail like a master craftsmen should, making you cheer on his hero’s, making you pull for their survival, making you cry out in agony at the cliff hanger ending. Not going to spoil that one for you folks. This book is an amazingly quick read at just a 137 pages, but that’s where Episode 1 comes in, Yes this series will continues and this Review says she will continue as well and I can not wait to read more. Saul writes in several speculative fiction genres, including horror, cyberpunk, biopunk, and straight science fiction. A former Army medic and trauma specialist, he earned a PhD in molecular biology and genetics; his works are heavily informed by these past experiences. Except for the possum, which he’s sure is the reincarnated spirit of Jack Torrance. You can pick up all of The Gameland series and all of S.W Tanpeppers Works here on Amazon. The Road to Hell is paved With Zombies–Review is forth coming.